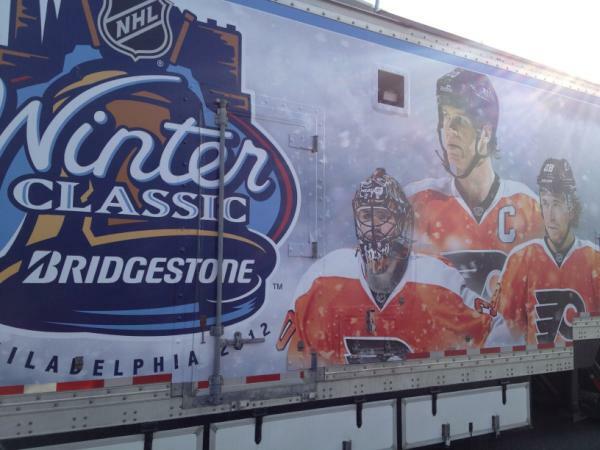 Yep, that is indeed the truck that carries the magical ice for the Winter Classic. It is parked outside of the Wells Fargo Center for the Flyers 1:00 PM showdown with the Boston Bruins. Today’s game will be the last game in Philadelphia for the Flyers before January 2. The team closes out December on a five-game road trip. Depressingly enough, the picture includes only one active player for the Flyers as captain Chris Pronger (center) is out for the season with severe post-concussion syndrome and the NHL’s leading scorer Claude Giroux (right) is out indefinitely with a concussion as well. For more Winter Classic news, check out the official Winter Classic page.